AAE welcomed Dolly, a pretty young filly, from the DreamCatcher Wild Horse and Burro Sanctuary on Feb 28, 2018. AAE is working with DC in a continued effort to support DreamCatcher's recovery and herd reduction efforts which is focused on rehoming young/captive born mustangs after the long illness and passing of their Executive Director, Barbara Clarke in November of 2016. There are many more in need of homes. Dolly spent some time at the Monty Roberts International Learning Center for gentling and basic handling. She is halterable but needs considerable time building trust and confidence. Handling hooves is still a work in progress. The right home will be with a person with mustang experience; a patient person willing to commit time and consistent efforts to bring this sweet girl along. 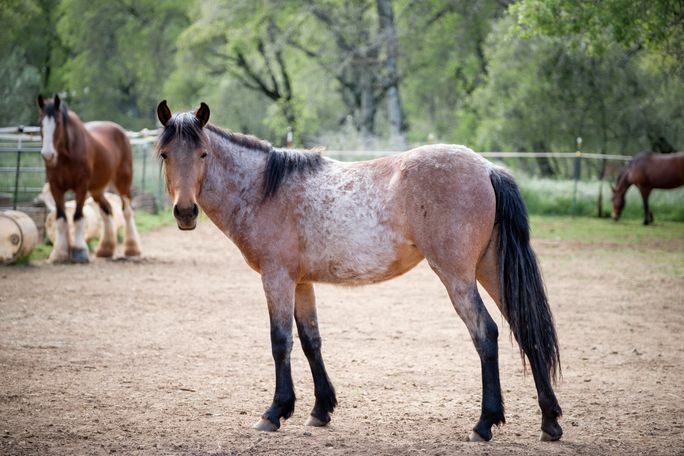 Dolly is a sweet, gentle filly that has been on the lower end of the hierarchy in a group and herd environment. She is soft, kind, and willing, with a growing curiosity that needs to be nurtured so this girl can shine. Dolly is scheduled for dental care on 5/3/18, and will be ready for her own person upon completion. Her handling/confidence building will continue during her stay at AAE.